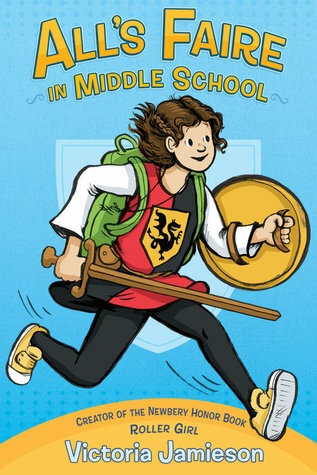 All's Faire in Middle School by Victoria Jamieson. Grades 4-7. Dial Books for Young Readers, September 2017. Reviewed from ARC provided by publisher. This fall, Imogene will be running from a dragon, forced to talk to crowds of strangers, and cleaning up horse poop. But even scarier? She'll be starting middle school. Imogene has grown up in the Renaissance Faire, a magical place frozen in time where knights still joust, people feast on giant turkey legs, and the queen visits from time to time. She's finally old enough to join the cast as a squire, an apprentice actor, this season. And after years of homeschooling, she's decided to start attending the local public school. This means the first time trying to find all her classes, figuring out who to sit with at lunch, dealing with mountains of homework, and trying to make friends with a bunch of strangers. And just when Imogene starts to think she's got everything figured out, everything goes horribly wrong. Okay, I loved ROLLER GIRL, but this one is even better. Victoria Jamieson presents a story about navigating middle school but with a twist. Imogene's grown up with her Renaissance Faire family. Every summer since she can remember, she's worked at her parents' shoppe and this year she's finally becoming an apprentice in the cast. She's also starting middle school (her choice) after years of being homeschooled. Middle school, it turns out, is trickier than Imogene had anticipated and she finds herself navigating a twisted maze of friendships, mean girls, strict teachers, and potential love interests. The Ren Faire theme is woven cleverly throughout the book - each chapter begins with an illuminated panel that harkens the reader back to books of the Renaissance time. Little details like Imogene's natural habit of thinking "Oh, fie!" when something goes amiss or her parents friends coming over for a roleplaying game really bring the Ren Faire culture to life. There are so many little recurring things that bring the entire novel together in a really nice way. There's the "scooch" to signify kids making room for friends. Imogene first experiences this with a wave of relief as one of the girls from her science class scooches over to make room for her at the cafeteria table. Later in the book, it comes back in, signifying that a rift is starting to mend. The narrative explores not only the complicated nature of middle school friendship, but it delves into class issues a little bit, too. Imogene never felt like she was lacking until she started comparing herself to the other kids at school, and in particular the queen bee of her group of friends. Suddenly she needs the right shoes, the right brand name jeans, etc. etc. Suddenly, her Ref Faire life doesn't feel like enough, when it always did before. I know there's a lot here that will be captured in a reread and this is the type of book that begs to be read again and again. This is a surefire hit for fans of Raina Telgemeier's Smile, Cece Bell's El Deafo, or Shannon Hale & LeUyen Pham's Real Friends. Hand it to them post haste, for it's sure to garner many admirers. Huzzah!